Home » Blogroll » What is Pinscreen Animation? Pinscreen animation makes use of a screen which is entirely filled with moveable pins and can be moved in or out by pushing an object to appear on the screen. The screen is lit from the front side so that the pins cast shadows. To create animated films the pinscreen animation technique has been used with a range of textural effects challenging to achieve with any other animation technique which including traditional cel animation. 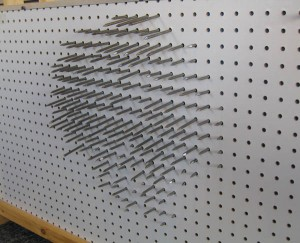 A pinscreen is a white screen drilled with thousands of pins in small holes. Light shines from the one side of the screen causing each pin to cast a shadow. Each pin moves in and out through the holes can cast different shadows. These pins do not move easily they presenting some resistance to movement to avoid unintended dislocation and thus image error. The pins motion resistance depends on the pinscreen calibration. The white screen becomes darker the farther the pins are pushed out, pointing from the surface. When more pins are pushed in less shadows are formed the lighter the screen becomes giving a greyish color and ultimately an all-white screen again. The image creation process in the pinscreen is based on the shadows the pins cast over the white surface board, enabling the synthesis of black and white images with intermediate grey levels. In below images shows an amplified model of a fraction of the pinscreen used to demonstrate the shading process. Let assume that you are looking at the front surface board. When the pins are not appearing from the surface, no shadows are formed and the surface seems completely white. If one of the pins is pressing from the backside, its shadow will be cast on the white surface board. The further the pin is moved the longer the shadow appears. Instead of one pin, push a group of pins. Suppose we done it in only half portion. The shadows cast will appear with white spaces between them and a medium grey color will be displayed. If the pins are entirely pushed, the shadow of each pin will overlay that of its neighbour. 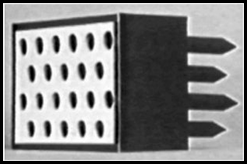 No light will reach the white surface board and black color is cast. The back surface shows the reverse effect acting as a negative. The Digital Pinscreen was developed between 1989 and 1995 by Pedro Faria Lopes and allowed to reproduce the traditional Pinscreen with gains both in ease of use and productivity. It is possible to simulate the Pinscreen using 3D primitives computer graphics and this approach is not suitable for real-time manipulation of the pins. On a Pinscreen, it is the shadows of the pins that create the image and not the pins themselves. That means there is no need to represent the pins visually, but only the shadows they cast. Furthermore the shadow can be interpreted as a rectangle with a length equivalent to the height of the pin and rotated in correspondence with the light source. 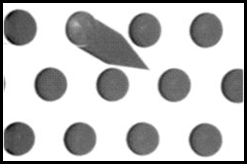 It means that the shadow of a pin has two properties which are length and orientation. As for the light source, assuming the light is far away from the surface (parallel rays), moving it around in a three-dimensional space only has effects in a two-dimensional plane: it only changes the length or orientation of the shadows of the pins, making it easier to change the shadows directly instead of the light source. 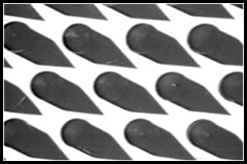 By defining a maximum shadow vector (MSV) as the length and orientation of the shadow, a pin cast it if its height is maximum than other pin heights have the same orientation of the MSV and its length proportional to the length of the MVS. Representing the shadows as rectangles and controlling the MSV, allow a fundamental shift in the way the Pinscreen image synthesis can be achieved: visually, it is possible to work only in 2D instead of 3D, which will result in very high gains in terms of interaction, visualization and ultimately, inefficiency that will allow processing of hundreds of thousands of pins in real-time. Because of the cost and labour-intensive animation process, many computer programs have been made with the purpose of simulating the images generated by a physical pinscreen. One of the benefits of using digital pinscreen animation is the recovery of images. With the traditional pinscreen, there is no other way to recover a previous image except for creating it again with no guarantee of accuracy. With digital pinscreen, the previous image can be retrieved and modified without having to be recreated. For students who are interested to learn more on Digital Pinscreen Animation and would like to experience and practice on a more professional level, please sign up today for Arena Animation Prime Course.